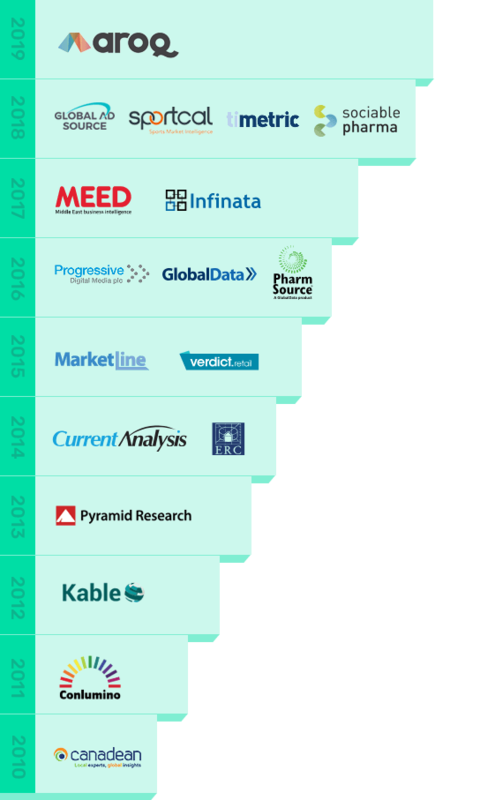 GlobalData was formed in 2016, following the consolidation of several well-established data and analytics providers, with heritage leading back over 50 years. Today, we are a truly unique research, consulting and events business, with unparalleled insight into the world’s largest industries. Aroq’s news, data and analysis services help executives across the food, drinks, automotive and apparel sectors make better decisions every day. Over the past 40 years, Canadean has become a market-leading provider of valuable and in-depth market research initially built up in beverages, and more recently in the CPG, Retail and Foodservice markets and related industries. The Group acquired Conlumino in 2012. This brand has now been incorporated into the Group, bringing further expertise as well as valuable research and analysis capabilities. For over 15 years, Current Analysis has supported global IT and telecom professionals with timely, practical market intelligence and advice to help them compete, innovate and improve performance. Since its foundation ERC has expanded its geographical focus of research and in-depth analysis to cover the tobacco and baby food industries globally. Global Ad Source provides advertising intelligence to global brands and global advertising agencies. With real-time advertising content from more than 70 markets, Global Ad Source delivers a filtered and insightful resource to discover advertising campaigns and brand communication strategy. Infinata provides business intelligence in the BioPharm (Healthcare) and wealth management space. Its primary business is focused on providing actionable leads and contacts for companies looking to sell into the Pharma and biotechnology industries. For more than 25 years, Kable has been providing an unparalleled understanding of key global markets and technology industries to its international client base. MarketLine is the perfect multi-disciplinary product, providing global Business Intelligence on Companies, Countries, Industries & Case Studies on an easy to use online platform. Online training & analyst support is included. Users can compare economic & demographic data, explore market value, volume and share & build lists of 400k Companies with contact details. Designed for our corporate clients, under our pledge we have been supporting Colleges, Universities, Libraries & Governments for 15yrs. MEED provides premium business information content with an industry focus on Construction, Infrastructure and projects in the Middle East. MEED has been a leading source of Middle East business intelligence for over 60 years. Our professional information analysts in PharmSource specialize in providing pharma, CMO and CRO executives with the intelligence they need to uncover outsourcing opportunities, grow revenues, and make confident business decisions. Progressive Digital Media provides a range of opportunities for its clients to interact with their customers and potential customers through over 80 annual events produced by its Arena division. These include flagship events in clinical trials and consumer markets. Progressive’s Affiliate Futures division helps clients grow their businesses through online affiliate marketing services. Pyramid Research provides analysis and practical solutions that are uniquely focused on the identification and assessment of growth opportunities within the Technology industry value chains. Sociable Pharma offers a tailored range of research & analysis services that help clients at all stages of the pharmaceutical and biotech product lifecycle. Sociable Pharma’s solutions address the evolving intelligence priorities of each client, ensuring that clients always receive commercially-focused & highly relevant insight. Sportcal delivers sports market intelligence worldwide, providing in-depth sports data, analysis and information covering over 190 countries, spanning 97% of the globe. Sportcal is the essential resource for anyone involved in the business of sport. Timetric is a global information services provider for industries in the construction, infrastructure and financial services sectors. With offices in all major markets, Timetric uses its extensive research and analysis capabilities, with a delivery platform based on cutting-edge technologies, to provide its clients with actionable, high quality market and sector intelligence on a global scale. The Group acquired the Datamonitor Financial, Datamonitor Consumer, MarketLine and Verdict businesses from Informa Plc in 2015. These brands have now been incorporated into the Group, bringing further expertise as well as valuable research and analysis capabilities.